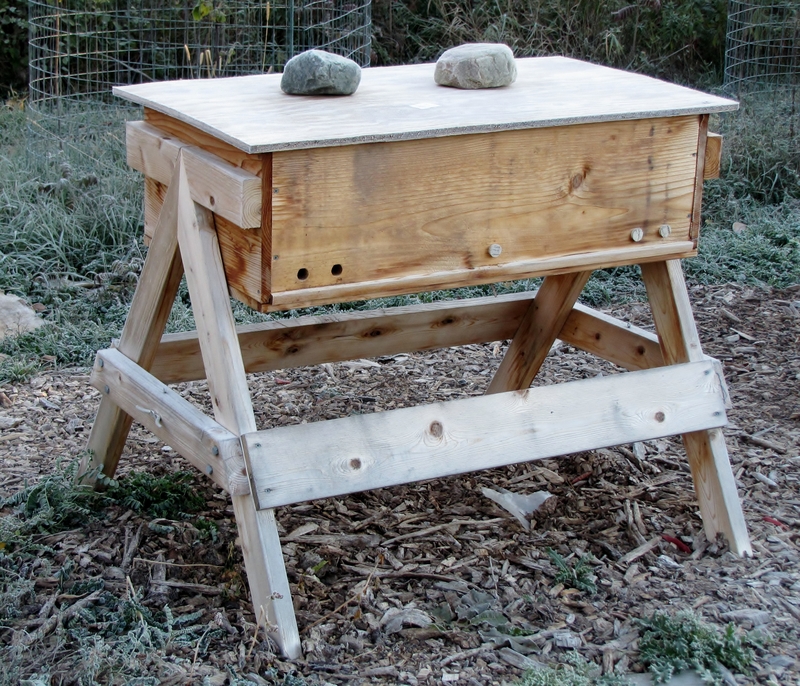 In what may be the last of our series discussing the features of our first hive, most of which we copied for our second, we describe the hive stand made for us by Keith Steller. As usual, click on a picture to see a larger version. A hive does not necessarily require a stand. 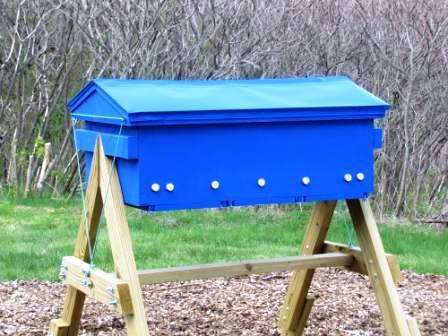 It is common for Langstroth hives to be on the ground or atop a few bricks and so might a horizontal hive be kept. But that reintroduces back-bending labor. The more common approach for horizontal hives is to attach a pair of legs to the small faces at either end of the hive, making what is sometimes called a honey cow. The legs are of a length to put the hive top somewhere between waist and shoulder high, wherever the individual beek finds convenient for lifting bars of comb. Unfortunately such legs are usually permanently attached and that would have made it awkward for us to transport our hive from Keith’s workshop/apiary to our yard. 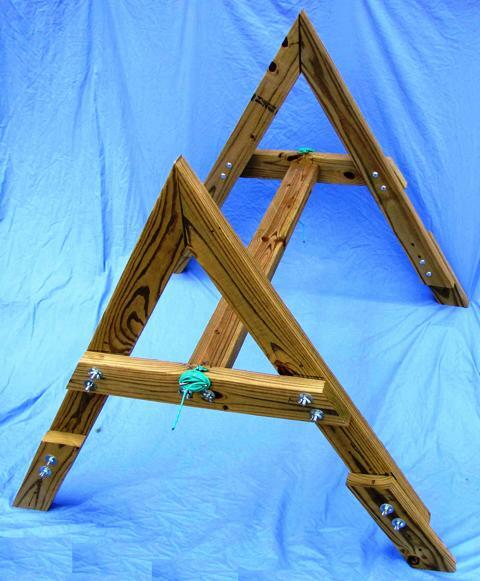 Keith’s solution was to design and build this very clever stand held together by carriage bolts, hanger bolts, washers, and wingnuts that can be assembled and disassembled in minutes without tools. The wingnut motif appears in other features of the hive as has been discussed in previous posts. Here are the parts of the disassembled stand. 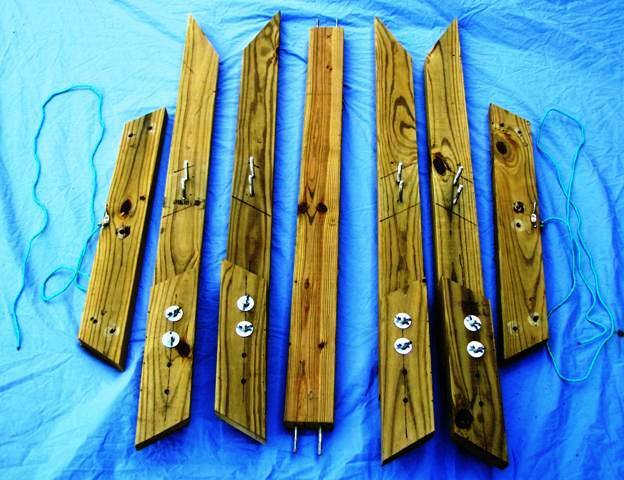 From left to right they are: a crossbar that will connect two legs of a side, the pair of legs(adjustable in length as explained further below), a stringer that runs under the hive connecting the two ends of the stand, the two legs of the other side, and the crossbar for that side. Each end of a crossbar has two holes that align with matching holes in a leg. 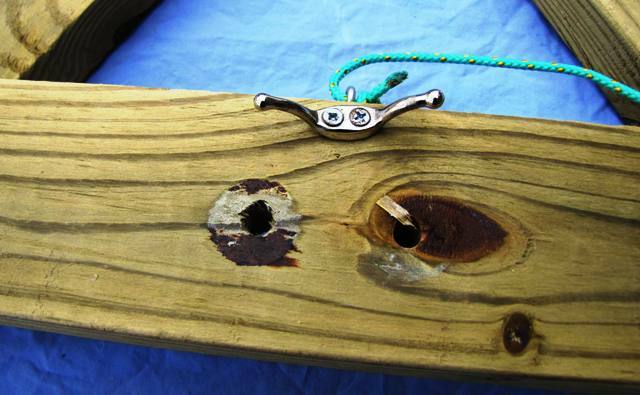 Once aligned, a bolt is inserted into each hole and locked in place with washer and, for tool-free assembly, a wingnut. All hardware should be suitable for outdoor use. In our case it is stainless steel. The three parts of each side assemble to make an “A”, the top of which fits into a cleat on the side of the hive. There is no hardware connecting the apex. It will be held closed by the weight of the hive. The middle of the crossbar has some details of interest. First, two holes through its face which will be used to connect it to the other “A” by the long stringer. Next the novel feature of a hitch on the face and an eyescrew on top which has a long piece of twine tied to it. 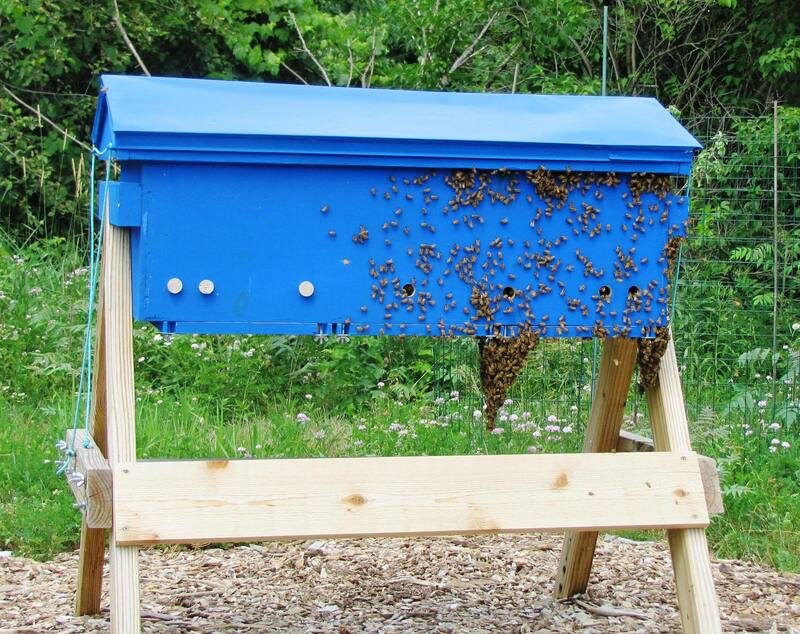 To digress a bit, the roof of a hive (horizontal or otherwise) is vulnerable to being removed by strong wind. The commonest solution, at least for flat-roofed hives, is to place a large rock or brick on top. The bees, of course, do not care but it seems incongruous for a beekeeper who has otherwise carefully painted and, perhaps, decorated the hive for human visual appeal to ruin the sight with a lump of rock. Instead Keith attached an eye screw at each corner of the roof and the twine from the crossbar is threaded through a pair of eye screws and then lashed around the hitch. 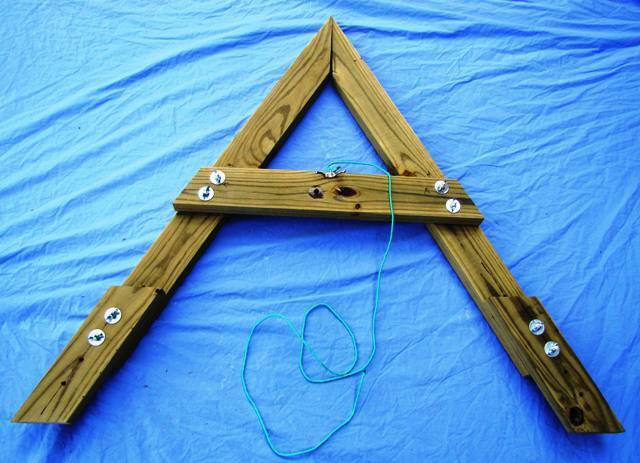 The stringer connects the crossbars of the two “A”s. 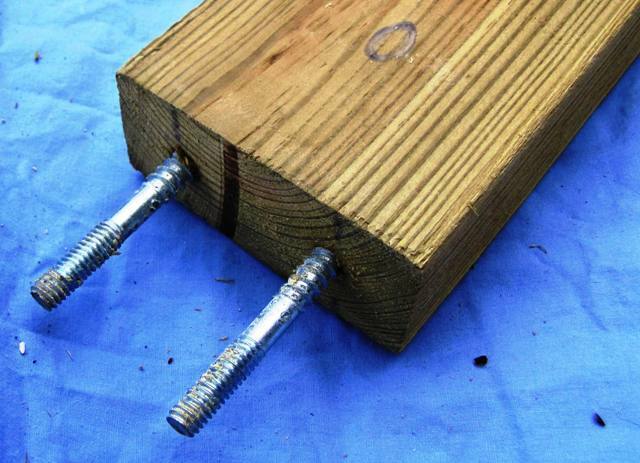 Each end has two hanger bolts which fit through corresponding holes in a crossbar. 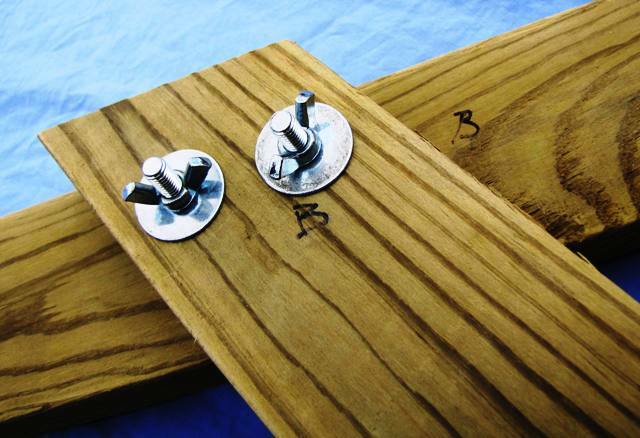 Washers and wingnuts are then applied and tightened. And here we see the assembled stand. 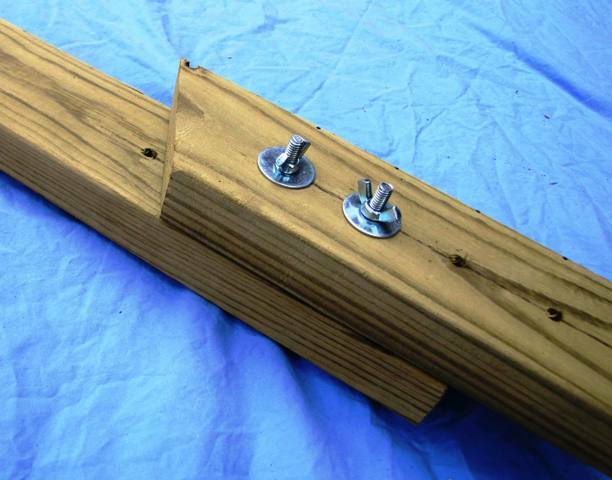 Each short side of our hive has an attached sturdy cleat, made by sawing a piece of two-by-four at an angle matching that of the apex of the stand. One of the resulting pieces is flipped and the two attached to provide a notch into which the stand apex fits. Finally, let us look at the height adjustment of the legs. It is again a use of carriage bolt and wingnut. The lower end of each leg has a series of evenly spaced holes matching the holes in a separate mobile piece. Depending upon which pairs of holes are used to attach the mobile piece to the leg, the mobile piece will more or less extend past the end of the leg piece, effectively making the compound leg longer or shorter. As pleased as we are with this stand, we made a few modifications to the design for our second year. First, we did not end up making much use of the adjustable length of the legs and have moved our hive to a more level area, so we dispensed with this feature by removing the mobile ends. The hive is left at a lower but still, possibly more, convenient height. Second, more importantly, the stand had a bit of wobble in the long direction as the “A”s can rock slightly. This is because rigidity in that direction is provided by only the thickness of the stringer’s ends butted up against the crossbars. We corrected this by attaching a wide board across the front legs as can be seen in more recent pictures of Annabelle, such as this one reused from a bearding post. The board is simply screwed into place rather than held together by hanger bolt and wing nut, as much else is, somewhat because we were in a hurry and used what was available but also because we do not anticipate again disassembling the stand. If we must then we may install hanger bolts at that time. The stand for Beatrix was built upon the same general lines but without any provision for disassembly, instead with everything screwed into place. Also she lacks any stringer at all but uses a wide board across her rear legs as well as her front. Thank you. Keith is a clever fellow and it is worthwhile to copy from him. I am curious about the construction of the Langstroth and so read this with interest and skimmed through some of the previous ones. 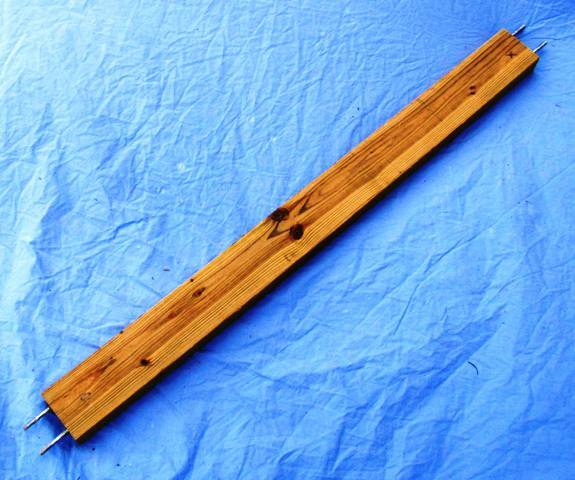 I might have missed it, but where would you put a queen excluder? In other words, how do you keep your queen from laying in honey frames? Horizontal hives generally do not bother with queen excluders. Speaking not from experience but merely repeating the lore, a bar of comb entirely filled with capped honey will serve the same purpose. The queen will not cross it to lay because that would break the brood volume into disjoint regions. That presupposes that at some time the nectar flow and foragers can “outrun” the laying queen. If such a bar of comb occurs too soon then the brood area stays small and the hive is called honey-bound. In that case empty bars would be inserted in the brood area rather than appended as we have been doing.